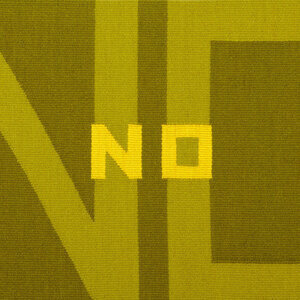 For this solo exhibition, Iverson explores the deceptive complexity of the word “no.” It’s a loaded word that can be empathetic and even soothing. It can register surprise or delight, shock or disappointment. It can stand alone as a one-word sentence yet requires context to be fully understood. Iverson uses shifts in composition, form, scale and, perhaps most crucially, color to explore the word’s context and relay meaning. In this era of protest and polarization, as we ask questions about refusal and consent, the intimate, human-scaled tapestries that make up “The Color of No” resonate with all of us. Iverson weaves her tapestries on a Gilmore loom, using natural materials including wool, silk, linen, mohair and cotton, which she hand-dyes using a variety of dye techniques to achieve vibrant hues. “Over the years the subject matter for my tapestries has changed but my passion for weaving and my strong interest in the physical properties of tapestry have remained constant,” said Iverson. Iverson has exhibited her work at the Central Museum of Textiles in Lodz, Poland; the Southeastern Center for Contemporary Art in Winston-Salem, N.C.; the Visions Museum in San Diego, Calif.; the Taubman Museum in Roanoke, Va.; the Appalachian Center for Crafts in Smithville, Tenn.; the American Textile History Museum in Lowell, Mass. ; and the Textile Museum in Washington, D.C., among other places. Her work is in the permanent collection of the Smithsonian American Art Museum’s Renwick Gallery as well as the collections of the Federal Reserve Bank, Capital One and others. Iverson has received fellowships from the National Endowment for the Arts and the Virginia Museum of Fine Arts. She was awarded the Theresa Pollak Award in 2011. Iverson earned her Master of Fine Arts from Philadelphia’s Tyler School of Art at Temple University and her Bachelor of Fine Arts from Colorado State University. She lives and works in Hanover County, Virginia.